We are at the airport many times a year to pick up our friends visiting us or to fly in and out of Victoria. We can pass time taking pictures and enjoying the display of airport arts and crafts. 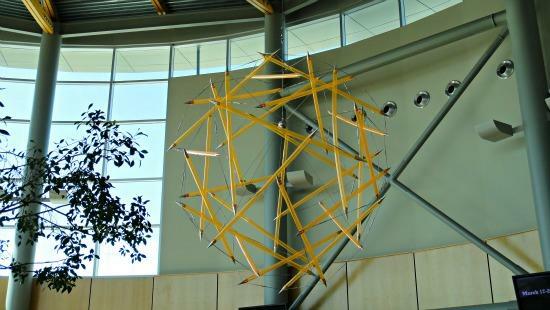 We find the quiet and stress free atmosphere at Victoria airport is ideal to enjoy its display of artwork. Display of Arts and Crafts in and outside the Airport Buildings sure to catch all visitors eyes. 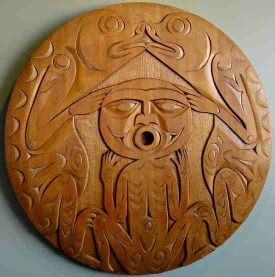 Airport Authority gives a special opportunity for talented artists in Vancouver Island to display their creative arts, crafts, sculptures in the airport as a showcase. Displaying these arts reflect respects of local values, a source of community pride of Island residents and that can be informative for travelers and visitors. Victoria BC Cultural history is so much connected to arts and crafts. Before European settlers Native Americans who lived here and still among us are great artists. 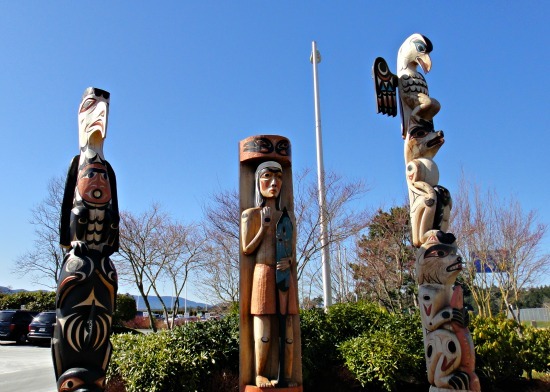 They are the creators of beautiful Totem poles, Masks and Crafts that you will see on your Victoria BC vacation. Later Europeans settlers add their artistic cultural heritage to Victoria BC. Victoria gave birth to one of Canada’s greatest artists - Emily Carr. Make a point to enjoy her paintings at the Victoria Art gallery on your Victoria BC vacation. Art and Craft Collection in the Airport is divided into 3 categories for easy entertainment. These are located throughout the airport. Take the rewarding challenge of finding them and taking some pictures. Art Wall is located near Tim Horton's Coffee Shop. You will see more art work displayed upstairs departure lounge before you fly away. These unique coffee tables can be found near coffee shops, 3rd floor Eagles Landing observation Lounge and departures area of the terminal in front of check-in counters. This is nice, quiet place to sit down and drink a cup of coffee. Sometime we go up to the Observation Lounge with our little one, she loves to watch landing and taking off air crafts while hanging around over there. Then we take a good lunch at white spot - a full service restaurant located just downstairs. 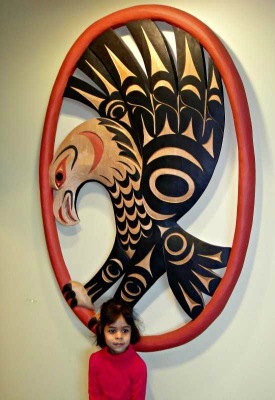 You find Carvings by Charles W. Elliott (Coast Salish Master Carver) at the Observation Lounge. Historical exhibit at the observation lounge displays the history of airport lands from the time of early First Nations to White settlers. Photographs of 1914 military training base for current day commercial airport. Three totem poles that you see here are. You see another piece of art outside the departure area of the Airport. Its a colorful metal sculpture of Poppy flowers design by a Victoria artist Illarion Gallant.